Oh man, that brings back memories! Always wanted to get my hands on that fig as a kid (and as an adult! ), but my goodness to they fetch a pretty penny on the secondary market! Loved the ROM comic series too. I had this (though I think it was originally my Uncle's) and pretty much all the ROM comics. I don't know what the hell happened to it or the comics. I may still have the comics in a box somewhere, but the figure is long gone. I totally wish I still had it, though. Is it weird that I happened to be laying in bef last night thinking about this character? Random. It's a shame ROM's not available to Marvel, even though I hear that elements from his stories were featured in the recent cosmic stories. 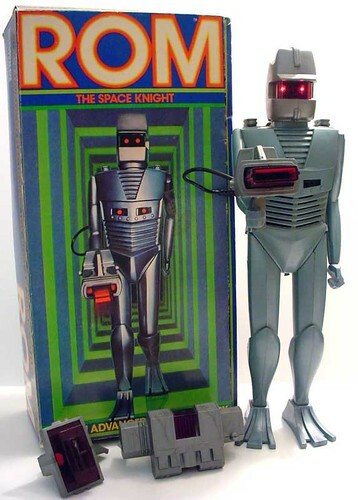 ROM is certainly a case of tie-in media far surpassing the product being sold! That type of thing would make an interesting article/TR list that I'm too lazy to research myself.